Treon's Realm: Nintendo Illustrates Their Amazing Software Lineup This Holiday! Nintendo Illustrates Their Amazing Software Lineup This Holiday! Nintendo has remained rather humble when illustrating its software strength when compared to the PS4 and XBOne. 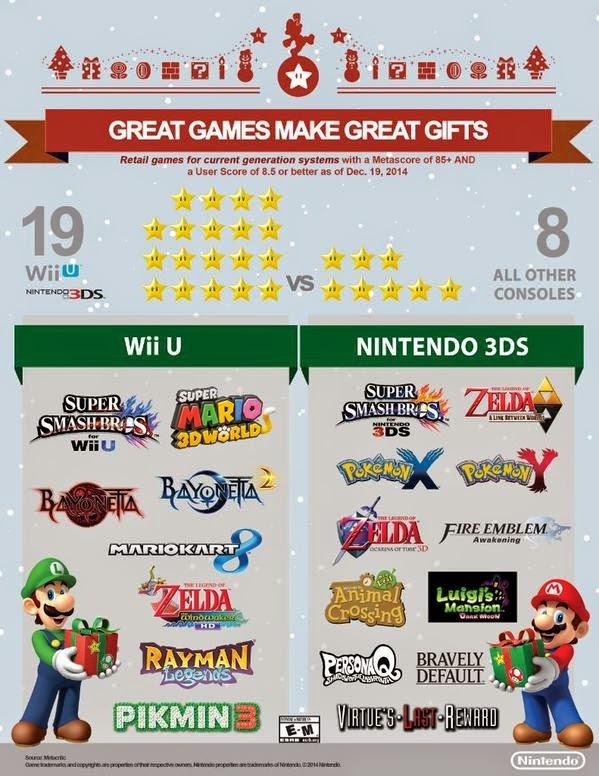 With the holiday's upon us and Nintendo's impressive array of software for both the Wii U and 3DS, the Big N has opted to skip the rather boring traditional statistics and instead given us a festive infographic that illustrates just how good their games really are. Using the notoriously harsh Metacritic, they make a very compelling case why any Gamer should have a Wii U and 3DS in their current collection. Even more impressive is the fact that the games listed scored an 85% or above from not only professional critics but also user scores which are particularly harsh on games. Enjoy!